This one’s for those with AA Breakdown cover, but you could apply this to anything. While they don’t advertise a discount for current customers, like many companies, they’ll offer discounts to those giving intention of leaving for a rival company. My AA payment was defaulted due to a lack of funds and poor money management on my part. When I was informed by my bank that the payment was missed I didn’t realise my AA service had gone up to nearly £19 a month. I rang them with the view to cancel and look elsewhere. After a short conversation, I was offered a 25% discount on my monthly payments even though I’m already 4 months into my current contract. So, while it seems the days of bartering may be long gone. It’s still worth asking. Scootronics have released a new product. A flywheel. First look, these flywheels look the same as others, but there’s a difference. The new flywheels from Scootronics are manufactured in India, this is nothing new, most Lambretta flywheels come from India, but Anthony has had them made to his own specifications. So this was to be a trip along the Western Front on the 100th Anniversary of the end of The First World War. 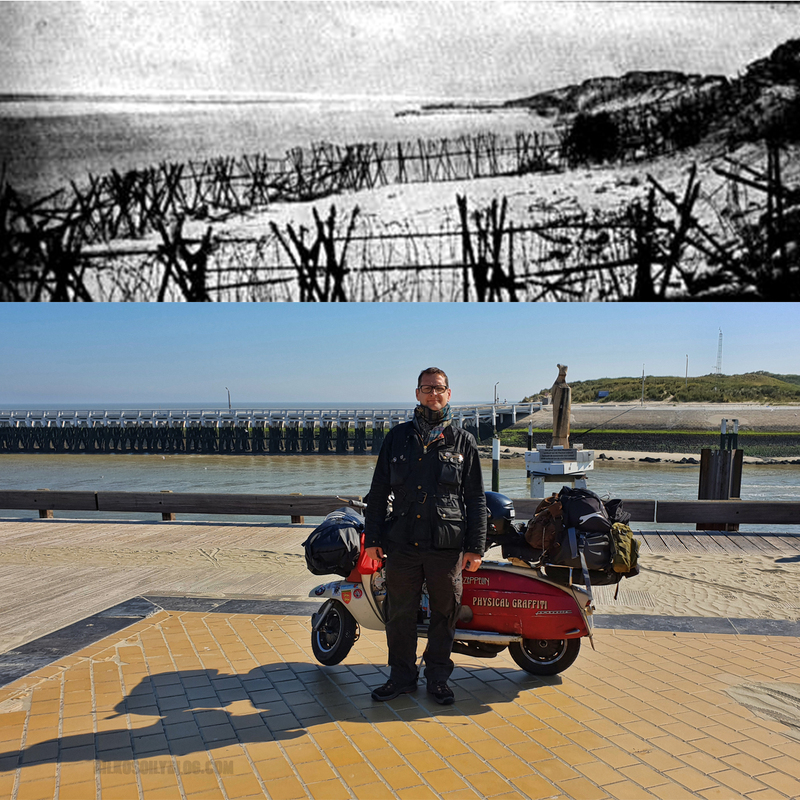 It wasn’t my first trip abroad by Lambretta, but it was the biggest I’d done. It wasn’t just the long mileage, but planning the stops and stays in the right places en route had to be taken into consideration and trying to plan the visits at important places that were relevant. Today I got up with a fuzzy head. My brother was also leaving for home at Lascours in the south of France and so he needed an early start for the long drive. We said our goodbyes and I then packed the Lambretta and then said goodbye to my nephew Benoit and his girlfriend Eva. They were to carry on their European tour (which was to end up taking nine months). Now it was time for the ride back. I originally planned further stops in Belgium but I was faced with some personal dilemmas. I made the hard decision to head back to Dunkerque for the boat to England, but not without stopping along the way at Bethune Cemetery to get a photograph of a friends relative who is buried there. Awake at the later time of half seven. This for me was a lie in. As stated, the Lambretta was rested for a few days as we used the car my brother hires to get around. We still had places to go to, so after breakfast with my brother, we headed off to visit more cemeteries. Today was one of the longer runs for the day. It was approximately 170 miles to my next hotel at Saint Quentin with a couple of diversionary stops along the way. There had been rain overnight. But already the roads were drying up from the morning sun. Once I loaded up the scooter I headed off. Today I got up a bit later. I decided to go to a local store in town for some Combat trousers. I only had jeans as spares and they were just too hot. I had the usual breakfast of yoghurt, Orange juice and coffee with my travel mug topped up with coffee. So, now with new combats purchased I was looking forward to getting to Pfetterhouse, the end of the line, so to speak. The end of The Western Front on the border with Switzerland.